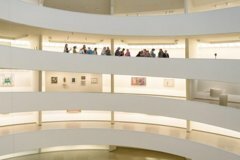 Visit the Solomon R. Guggenheim Museum before it opens to the general public. Experience a tour lead by a gallery educator that offers an immersive look into their collections and the famous Frank Lloyd Wright building. Before the museum opens to the public, join Guggenheim gallery educators for an intimate and immersive look at the museum’s collection or special exhibitions and the Frank Lloyd Wright building. Participants engage in conversation and a shared process of close examination. These tours are invaluable for anyone, from first-time visitors to long-term members, who would like to dive deeper into the museum-going experience. Record your observations of Impressionist and Post-Impressionist art through sketching and writing. Capture through photography unique architectural views of Frank Lloyd Wright’s masterpiece. Capture unique architectural views of Frank Lloyd Wright’s masterpiece through drawing. Thoughtfully explore Hilma af Klint: Paintings for the Future in a tour combining close looking and exercises in mindfulness. Designed by visionary American architect Frank Lloyd Wright, the Solomon R. Guggenheim Museum opened its doors in 1959. The Guggenheim is home to one of the world’s finest collections of modern and contemporary art—and is itself a masterpiece. Ascend the landmark building’s grand spiral that rises toward the central dome and experience the museum’s special exhibitions, which feature celebrated works from the nineteenth century through the present and form an “uninterrupted, beautiful symphony” of art and architecture, just as Wright intended.